Make these flourless peanut butter chocolate chip cookies with only 5 ingredients – peanut butter, brown sugar, egg, vanilla, and baking soda. They are so quick and easy that you’ll never make regular gluten-free chocolate peanut butter cookies again. I developed these flourless peanut butter chocolate chip cookies because I have to eat gluten-free. I love cookies (secretly I’m the cookie monster). If I could eat any treat, in unlimited quantities, without any negative consequences, I would choose cookies. I love them – all of them! Unfortunately for me, eating unlimited amounts of cookies isn’t an option (They don’t get along very well with my waistline)… I don’t know anyone that can eat an endless amount of cookies and not gain weight. Do you? Unfortunately, it’s a fact of life. In order to get my cookie fix and not derail my health and fitness goals, I get creative; and these cookies do not disappoint. They are soft, chewy, and don’t taste like they are in the least bit healthy. This recipe is my version of flourless peanut butter cookies. I used natural organic peanut butter, natural omega 3 eggs and sweetened them with brown sugar. As for the sweetener, I like using coconut sugar because the flavor is awesome (it has a caramel-like flavor), it is a natural sweetener, it contains fiber and other nutrients. However, I found it has to be mixed with a little bit of molasses, which basically turns it into brown sugar with molasses, which I read can act as an absorbent in baking. It’s working here, keeping most of the natural peanut butter oil in the cookies and not running everywhere. Coconut sugar can be a little bit hard to find, and pricey… If you are dying to try these delicious cookies and don’t have coconut sugar on hand, honey works in a pinch. The drawback is the dough needs to be refrigerated overnight, or in the freezer for a few hours, but as long as it’s chilled firm they come out great. Brown sugar is the easiest sweetener to use if you aren’t as picky about natural ingredients as I am. I tried these with flax eggs and had no problems and list the simple way to make flax eggs in the recipe. You need to watch these closely in the oven. It’s really easy to overcook them and have them turn out crunchy. If you are a purest, the chocolate chips are totally optional. My biggest tip when using natural peanut butter is to make sure your peanut butter is well stirred. I think it needs a little more than most of us have the time and energy to do by hand. I get great results with my electric mixer (take one beater off so you can mix it right in the jar), as well as my stick blender. I use one of these to mix my natural peanut butter every time I open a new jar. They do a better job stirring it up than I ever could, in a fraction of the time. Whether I use the mixer or the stick blender is usually just a matter of which one is clean or closest to hand. If you’re using your mixer, hang on tight to the jar or get someone to hold it still for you. 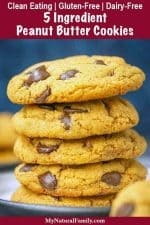 These 5 ingredient peanut butter cookies are so easy your kids can make them and so delicious you’ll want a batch all to yourself. Best of all, they’re made with ingredients you can feel good about feeding your family. Real peanut butter is healthy in many ways. It contains healthy oils which lower cholesterol, it’s rich in nutrients, and it’s a good source of protein and fiber. I buy natural peanut butter to avoid additives like corn syrup and hydrogenated oils that many brands use, but many recipes specify not to use natural peanut butter when making flourless cookies. 5 ingredient peanut butter cookie recipes are so popular online these days. The simplicity appealed to me, not to mention they’re naturally gluten-free, but most of the recipes I looked at actually specified not to use natural peanut butter. It took a little research and a lot of experimenting to figure out how to use natural peanut butter, but talk about time well spent! Now we can enjoy Clean Eating peanut butter cookies anytime, and they’re so easy to make the kids usually do most of the work. The real peanut butter flavor is wonderful, and I actually feel good about the ingredients. I would love to know if you try these and what you think. Please comment below! Am I the only person who thinks the recipe is amazing and crazy that you can use so few ingredients and not even flour and actually end up with a cookie? I would love for you to comment below and let me know what you think about this recipe! Make these flourless peanut butter chocolate chip cookies with only 5 ingredients – peanut butter, brown sugar, egg, vanilla and baking soda. They are so quick and easy that you’ll never make regular gluten-free chocolate peanut butter cookies again. Heat oven to 350 F. Line a cookie sheet with parchment paper or a baking mat. Combine egg and sugar in a mixing bowl and beat for 2-3 minutes. The mixture should gain volume, thicken and change to a paler brown. Don’t skip this step. Beating the egg activates the proteins that will hold the cookie together and also whips air into the mix to make your cookies lighter. After beating, add vanilla, baking soda, peanut butter and chocolate chips, if you are using. Beat together just until mixed, 10-20 seconds at most. If using honey – the dough needs to be refrigerated overnight, or in the freezer for a few hours, but as long as it’s chilled firm they come out great. To make 12 large cookies, drop the dough by round tablespoons, or use a one-tablespoon, medium cookie scoop. The whole dozen will fit on a standard sheet. Peanut butter cookies will not flatten completely on their own. Take a flat-bottomed cup and press them down. If you do it before putting them in the oven, they will have a very smooth top, so criss-cross a fork design along the top. If you like a more natural look to your cookies, press the tops down as soon as you remove them from the oven. Bake 9-11 minutes, or until the edges just start to brown. They’re very soft right out of the oven, let them set for a few minutes before moving to a cooling rack. Peanut butter is a sticky ingredient that is hard to measure in traditional measuring cups. I use an adjustable measuring cup to make sure ingredients are easy to get in and then back out of the cup. This cup works great for any kind of ingredient but especially for thick items that stick to your cup. If you haven’t used natural nut butters before there are a few tricks. Most end up separating, with the oil on top and thicker peanut butter residue below. You need to mix it properly, or you’ll end up with very runny and oily peanut butter in the beginning and then a thick paste as you use more of the jar. To avoid that, you need to mix the oil in thoroughly. The best way I’ve found is to take an icing spatula and mix in the oil so that it’s not sitting at the top of the jar. Try to get all the way down to the bottom of the jar and scrape along the bottom and sides of the jar as you stir. As you pull out the spatula, make sure to scrape the peanut butter back in to the jar, or you’ll lose quite a bit of product. Set the spatula aside and take your hand mixer, with one regular beater only (not the whisking beater), and put it down deep in the jar. Once the beater is in the jar, hold the jar as tightly as you can and turn the mixer on low. It will take about 30 seconds to 1 minute to thoroughly mix the oil in, but it will be worth it. Remember to mix the oil in with a spatula first and then hold on tightly to the jar at all times. I can speak from experience that you will spend a very long time cleaning nut oil off multiple surfaces in your kitchen if you leave the oil on top or let go of the jar while mixing! Store your nut butter in the refrigerator to keep separation to a minimum. Since the oil in the nut butter will harden, take the jar out of the refrigerator to soften an hour or two before cooking with it. After a thorough mixing, you should be able to use a regular butter knife to keep the oil mixed in. If you leave your nut butter out and it separates, just repeat the mixing process again.